Greenland is losing about 40 trillion pounds more ice a year than scientists had thought, according to a new study that used GPS to help estimate how much is melting. So instead of losing on average 550 trillion pounds of ice each year between 2003 and 2013, Greenland lost about 590 trillion pounds , said co-author Michael Bevis of Ohio State University in a study published Wednesday in the journal Science Advances . That's about a 7.6 percent difference. The Empire State Building weighs 730 million pounds, so 40 trillion pounds a year is the equivalent to more than 50,000 Empire State Buildings. "If you look at the last 15 years since we've been having these measurements, it's clearly getting worse, the ice loss," Bevis said. "It is pretty scary." Overall, though, it is still "a small percentage. I don't think it changes the picture of what's going on," cautioned study co-author Beata Csatho at the University at Buffalo. The extra ice loss adds a tiny amount—one-sixtieth of an inch (0.4 mm) a decade—to global sea level rise, Bevis said. 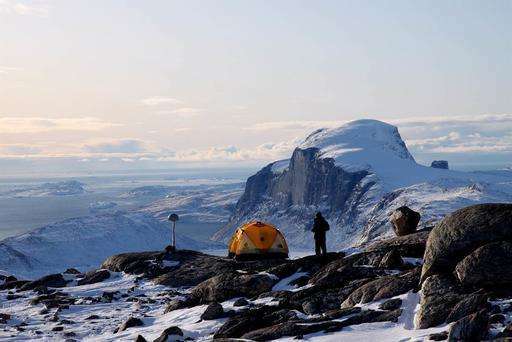 Altogether, Greenland melt adds one fiftieth of an inch—0.54 mm— a decade, he said. "Not good news certainly as the values are already larger than we'd had wished, but not a dramatic change in the overall already very alarming pattern we've been seeing over the past couple decades," said Duke University climate scientist Drew Shindell, who wasn't part of the study team. Most measurements of ice sheet loss in Greenland and Antarctica use a satellite that measures changes in gravity and uses computer simulations to calculate the weight loss of ice. But the trouble is that as ice sheets melt, ground juts up to take its place, both instantly and slowly over centuries. The rocks that rise to replace the heavier ice are counted in the overall ice mass by the satellite and thus the satellites overstate how much ice there is, Bevis said. The new measurements that use global positioning satellites and other sources compensate for that and are thus more accurate, Bevis said. Erik Ivins, a senior research scientist at NASA's sea level and ice group who wasn't part of the team, called the study a significant breakthrough. Hmmm. Lots of ice lost in the North, where 90% of fossil fuels are burnt. No definitive change in the South, where the rest are burned. CO2 is all over the Earth, but heat is transported from Equator to pole. Temperature fluctuates. It fluctuates up and down with the Solar cycle and the combustion of fuel. CO2 goes up - not down. CO2 is 40x weaker than water as a GHG. A 1% change in CO2 supposedly causes a feedback effect. But a >>1% change in water vapor, occurs daily, and causes no such effect. When will they figure it out? Doesn't matter, the problem is solved. Wind, solar, super-conducting cables. Hurrah! I see you STILL havent learned Psychrometry Water_Prophet or how to assess distribution of heat or importance of Specific Heat or understood spectra re CO2 vs H2O & re altitude distribution - so you're at it again posting oddities not particularly quantitative & completely unlike anyone who has the university degrees you claimed. How many was it Water_Prophet, 4 degrees & one not technical ? Where did you do Math or do you want me to pull up your old completely wrong Math of last years proving you are a waste of time here ? Did you actually ever go to university since last year & get another degree eg applied Math ? Heard of sine & cos Water_Prophet/greg - you know incident angle re Sol's light upon poles ? Such an interesting question. Tens of thousands of scientists - over generations of science - studying the system - all come to the same conclusion - that ghg are causing the system to warm - and the ice sheets are melting. But Water Prophet knows better. Yes...yes...very interesting. The onion jackass, boasts about his recent 2 day, 1200 mile, CO2 spewing jaunt, in which he emits over a tenth of the annual US average, yet he can come here and bray like the jackass at the heretics. Interesting indeed, that this jackass claims he is saving the world, imagine what he would do if he didn't believe the scientists. Phys1, exactly what I was wondering. Also, would be interesting how many milligrams it is. And how many drops, based on different definitions of a drop. LOL. GHG are most known for their homeopathic properties. That is, they remember where they were burned and ensure their distribution is always directly proportionate to their point of origin. It's just one of the many things that is so fascinating about climate science. That and the unicorn rainbow farts. Actually it does. I think you're forgetting to consider the time that water vapour stays as an amplifier in the system vs CO2. Sorry I couldn't think of a snarky witty way to say that. Yes, water vapour is a more powerful GHG than CO2. But CO2 lasts in the system much longer. Hmmmm. Hundreds of thousands of people die each winter due to the cold. A few pitiful little islands and coastlines may get flooded out but the benefits of a warmer climate are enormous. Due to population growth, more crops will be needed and year-round growing seasons will be a boon. Compare with number dying in; Africa, Indian sub-continent, south america etc from dehydration/heat stroke etc ? Otherwise as you fail in "Comparative Analysis" you come across as biased & that means stupid in that you ignore the full set of consequences especially food production ! What are the specific benefits when traditional crop growing regions suffer drop in rainfall or have their topsoil washed away in floods ? Other "benefits" please rrrander ? Evidence - otherwise your unsupportable claims make you look stupid or paid or worse - both ? few pitiful little islands and coastlines may get flooded out but the benefits of a warmer climate are enormous. I don't think you understand the concept of a 'coastline'. Much less how many people live along them whose livelyhood gets destroyed (and who will then try to move to other countries - like yours - seeking a new life). Crops are not only dependent on temperature but on availability of fresh water (which decreases with warmer climate) and arable land (which is basically all in use and which will only decrease due to rising seas). AND on harsh winters to keep pest populations down. No...warmer climates will not be 'good times'. Not by a long shot. I suggest unanimous reporting of these recurring nasty comments. gkam - I just never look at his/her comments. Total ignore - with no peeking. Leaves your energy free for important stuff. The consummate jackass brays. If only he would take a peek at his own hypocrisy. This is the jackass who boasted about his recent 2 day, 1200 mile, CO2 spewing jaunt, in which he emitted over a tenth of the US annual average. Yet, he has the audacity to come here and preach...er...excuse me...bray at the heretics. That's what he calls, important stuff. Excessive water vapor can eventually be deposited on the ground in solid form as the high-albedo substances 'snow' and 'ice.' Whenever a denier tries to make the argument that water is a better greenhouse gas than carbon dioxide, ask them why they've forgotten ice, snow, clouds, and thunderstorms, and point out that global climate models have not forgotten them. That clouds have a bottom ? Really ? Hmm, you forgotten the Whole dynamic ? Hrrmm, what really yah mean by "enough", comparatively "..water vapour turns.." where yah think it radiates heat to ? Sure but, tiny periods & not useful where Insolation angle close to 90 deg ie equatorial regions is negligible (so hot there) whilst regions closer to pole angle less than 90 progressively ? As a strategically inspired poster I ask again why you even want that rubbish cluttering your views ie Ignore, greenonions points out there's value in ignoring & especially re antigoracles blurts - he lost it long ago & has nil understanding of comparative leverage. Attacking someone for driving a car isnt particularly smart, most do it & the singular value is tiny in comparison with canvassing powers that be we need this issue addressed seriously..
.. Do the math. It comes out to about 18 cubic kilometers. When you put this in perspective, it doesn't sound big at all. Proves he's no knowledge re "Rate of Change" in conjunction with Specific Heat ! ie BartV cannot connect dots that sustained temperature change upwards equates to Massive energy addition moderated by ocean Specific heat ! ie. Did BartV get education anywhere other than idle bible claims - prophesied was it ? BartV please get a Grip of Physics, you know the stuff only learned recently when people dumped to emotional unsupportable claims of bibles to "Have no thought for the Morrow" - get it ? Tell us BartV Why jesus' dad Never taught him to write ? Do yah think islam would have reigned now as major religion if jesus could write & better than others ? What can be done about those volcanoes melting the Greenland ice? The braying jackass is at it again. We all know where he pulled that one out from. You can't expect a braying jackass to know that volcanoes are NOT always active. The IPCC & those firmly educated in Physics & focused on Physics as it progress under Discipline of the Scientific Method ? What debate do you imagine any scientists have lost ? You adon't communicate particularly precisely, just like all claimed gods, vague & indistinct & without clarification of assumptions ? BartV you don't realise how lucky you are to live in a time where; communication, linguistics & psychology is so much better than old primitive times when all it took was a burning bush to impress the uneducated & illiterate ? Why is it we humans are so VERY much better communicators than ANY god that was ever claimed ? BartV why can't you be far more precise & articulate ? Or ask them why water vapor is in the air when you can't see it. In fact 20x more prevalent in intermediate latitudes and up to 80x more prevalent in the tropics. The day to night fluctuations in water vapor should have more impact than CO2. Further, let me tell you something about climate scientists: They aren't nearly as certain as you morons are. Water pfffttt!! Welcome back! I'm fine, thanks for asking, you still smoking that evil weed? The day and night fluctuations from water DO have more impact than that of Co2. That's why scientists take it into account when they are making their models. Ira told me that! Sad that you have come back after all this time and still do not understand the difference in residence time between Co2 vrs H2o. Not surprising, you never were willing to examine your cherished beliefs, just sad. So Water Pfffttt you, going to be adding more dumb comments like you were so fond of doing last time? Ah, but Maggie, all I say is demonstrable. Your only answers are juvenile insults. Oh well. I wish I could do my work by publishing insults. If everyone could do that, we'd be back to the Dark Ages in moments! How have you been? Have you learned anything recently that enforces or deflates your beliefs? What is it? The braying jackass is at it again. No comment indeed, just as you have done concerning your recent 2 day, 1200 mile, CO2 spewing jaunt, in which you emitted over a tenth of the US annual average. Not even a second thought as to what would happen if everyone in the US did as you. So, bray on jackass....bray on. That is an invalid criterium to decide scientific questions. No, it is not. When "scientists" or "science-commentators" have to resort to all kinds of personal assults, and ignore to indulge in true scientific debate, they have already degenerated into the moral abyss, and their thinking has become warped. @philstacy "What can be done about those volcanoes melting the Greenland ice?" Next you'll be telling us Greenland's losing so much mass so fast just by eating right and being active. Looks like Europe's in for a chill. Hope this melt passes soon which I doubt. They will be double whammied by the change in ocean current combining with low sunspot output and increasing volcanic activity. I believe its traditionally thought that the melt from Greenland pools over the currant forming are of the Atlantic. It is said to disrupt the saline portion of the theromhaline current. Usually, warmer salter currents give up their heat to the atmosphere which then moves over Europe in the winter. These cooled, saltier waters are significantly denser than the ice sheet melts but not necessarily colder. They sink and get swept past Africa and around again. 40 trillion pounds, how many cubic furlongs is that? No, no, no - cubic furrowlongs is a measure of volume. Weight you should always measure in elephants. Please get a grip, one line questions without a reference doesnt wrk in your favour - it doesnt engender dialectic & it doesnt lay the groundwork for a mature discourse. Tell us about the No. of volcanos & their combined heat output, can you do that ? Whilst at it be a bit more complete than ordinary unintelligent deniers & find a paper, study or other publication which shows delta altitude of the ice whether near ocean or inland, can you do that ? now I might be wrong so find the data & prove me wrong, can you do that ? Please be smart & compare Radiative forcing of ~ 1.5Wm^2 with ALL geothermal - can you do that ? So factor in all 3 forms of heat transfer with thermographs for the ice, can you do that ? 3. Radiative, re infra red light of warmer regions absorbed by colder - which raises their temperature. Conclusion: Massive heat to warm 5.7 Quintillion ! On what basis can you make such outrageous claim - as its already declined & due to reverse ? Why, what causal or even historical pattern suggests this ? Is it some faith based thing as some religious zealots claimed "god won't let it happen so we won't destroy what he made" ? Strange as the god (if omniscient) could predict the future & then bring out an update to educate ? Of what, the air of the ocean or both, haven't you learned about comparative specific heat yet - didnt I mention it before, didn't you read ? Beg Pardon seen last 16 months ? Its called physics - ie Spectra, yah know that stuff you learned in your claimed 4 degrees ? By how much, factor in visible to IR surface transfer - did you ? Further, let me tell you something about climate scientists: They aren't nearly as certain as you morons are. How 'bout that? Your only concern your ego ! You seem to be claiming that water is *not* held up by a separate heat source and that it manages to traverse the atmosphere Despite large changes in energy/temperature Despite the proven knowledge of Psychrometry ? How is it possible Water_Prophet, you have anything to refute Psychrometry or fail to understand it ? Have you learned anything recently that enforces or deflates your beliefs? What is it? Water_Prophet unfortunately shows evidence he's nil education in ALL of the above ! Your 4 degrees please ?